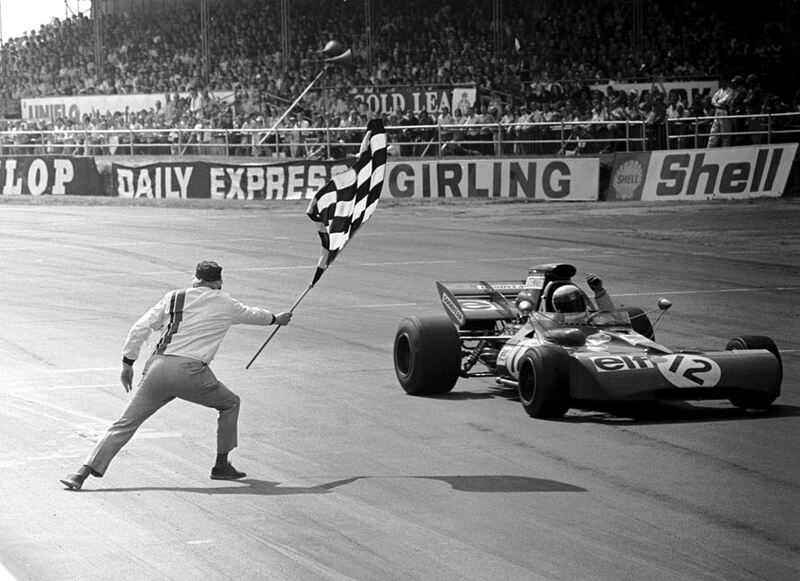 Jackie Stewart took yet another win as his Tyrrell led home the field at Silverstone to take his second and final British Grand Prix victory. The Scotsman increased his lead in the world championship after defeating Ronnie Peterson's March but it was Clay Regazzoni who qualified on pole position for Ferrari ahead of Stewart and Jo Siffert's BRM. Emerson Fittipaldi was fourth quickest for Lotus ahead of the March of Ronnie Peterson which was powered by a Cosworth engine again after an unsuccessful experiment with Alfa Romeo. Regazzoni and team-mate Jacky Ickx led away with Stewart's Tyrrell third while British drivers Jack Oliver (McLaren) and Graham Hill (Brabham) collided at the back of the field which caused both of them to retire without a lap completed. Stewart moved ahead of Ickx on lap two as did Siffert and the flying Scotsman then took the lead on lap four after overtaking Regazzoni at the fast right-hander of Stowe Corner. "The Ferraris were ahead of me at the start but they kept making mistakes," said Stewart. Stewart then established a healthy lead as Siffert moved past Regazzoni on lap five but behind the leaders, Emerson Fittipaldi's Lotus worked its way up to the top six after a bad start dropped it to 11th place. Siffert's challenge faded when he developed a vibration and was caught and repassed by Regazzoni while Ickx retired to the pits with engine failure after 36 laps. He was followed soon after by Siffert, whose BRM developed a misfire to add to its vibration. That promoted Peterson to third, which became second when Regazzoni retired with engine failure. Up to third had came Tim Schenken (Brabham) but he was denied a podium finish as his gearbox broke on lap 63 meaning that Fittipaldi chased home Peterson with the March of Henri Pescarolo in fourth ahead of Rolf Stommelen and John Surtees in their Surtees TS9s.